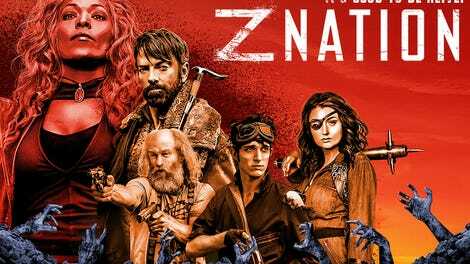 In a season that has already provided so many unexpected surprises, managing to have a death really mean something on Z Nation might be the most unusual one yet. Sure, there have been losses before on the show, and even a few that were felt. Garnett back in season one was a big one, and Hector was part of the crew, but the majority of the deaths haven’t really registered in the emotional sense. Cassandra was already a zombie when 10k put her out of her misery. Mack is the closest we’ve gotten to a fatality that actually made an impact on someone in the group, but that was in the middle of an already powerful and moving episode, season two highlight “White Light.” Here, everything happening around Murphy and Lucy is just boilerplate Z Nation (well, except for Warren—more on her shortly.) The Frankenzombie is textbook episode filler, exactly the kind of gross creature you’d expect the series to serve up in a normal exploration installment. That’s not to say it’s bad, just a bit predictable. But while the facility and its mad-scientist monster were doling out more of the same, the death of Lucy ended up packing an unanticipated punch, another step forward for the series and a rich conclusion to this story. Last season really began the exploration of Murphy the man in earnest, with the best episode of the season delving into his fears and hopes in equal measure, revealing the humanity behind the bravado. After threatening his life with the zombie bite at the end of “The Unknowns,” this episode zeroes in on the love he has for his daughter, and ends by flipping the script, having Lucy sacrifice herself to save her father. Murphy’s own pleas are ignored: “I am your father, and that means your life is more important than mine,” he demands, to no avail. What makes it work is how patiently the show draws out this familial farewell. Lucy is her usual self for the first half of it, exasperated with her dad even when he’s trying to explain how much he loves her. Slowly, she’s drawn in by his tales of her mother, and their brief time together. By the time he’s struggling to hold on again, and confusing his now adult daughter with her mother (well done, bringing back the actor who played Serena to portray her full-grown daughter), Lucy’s realizing just how deep his love runs, and that connection brings her to bite him, over and over, pushing her into advanced old age and saving his life. It’s a deliberate and methodical tactic that pays dividends in earning this formerly featherweight series yet more genuine pathos, leveling up in quality by ticking another box on the checklist of evolution: Making mortality mean something. Warren, meanwhile, is falling further still into her alternate reality. 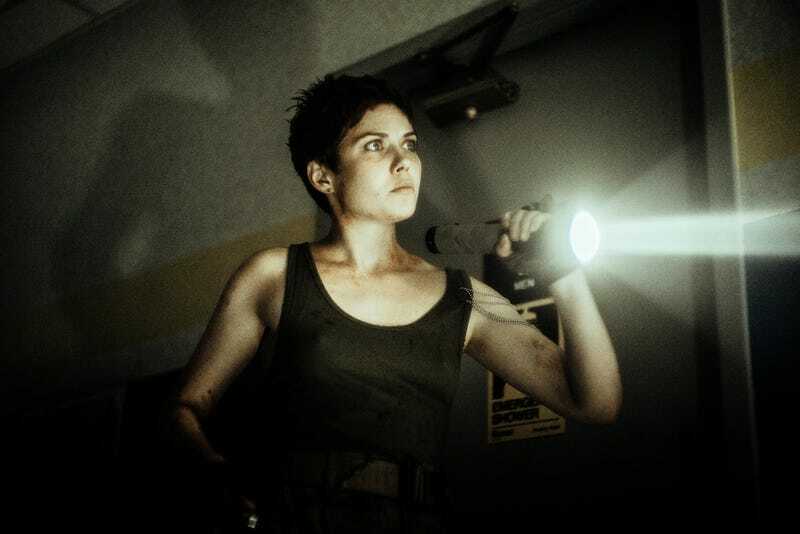 She traverses the black rainbow dimension and back again tonight, literally opening a door into the scorched-earth landscape and walking across it until she arrives at another doorway back into the facility. Not only that, but she has somehow been given mental instructions, far beyond the impulse to merely travel a certain direction as before. No, she gets keycodes, maps, and a target to acquire—even the order to inject herself with something after removing the container and being exposed to gas. It’s much too detailed to be anything but deliberate, which is why she demands to know if the scientist recognizes her. “I’ve never been here before?” she asks him, incredulous. But he assures her it’s the first time; figuring out why the hell she was sent to acquire a mysterious container will have to remain a question to ask whoever has established this mental connection with her. Honestly, given how much the rest of “Back From The Undead” lands, the rest of the action can be forgiven for its rote nature. 10k, Doc, and Sarge explore the facility, discovering the mutilated body parts, all still wriggling in their respective locations, and are appropriately creeped out. (“I dunno who’s responsible for this—but I don’t like them,” 10k says, ever the forthright one.) Besides the showdown with Bleeker the Frankenzombie, the other notable moment was the zombie finger crawling inside Doc, until 10k cuts him open and they can squeeze it out. It’s the kind of gonzo gore-meets-silliness that used to be the show’s bread and butter, so a little bit of it here and there isn’t unwelcome. It’s just being moved to the backseat of the narrative, as it should. It’s an entertaining enough beat, but the show knows the real fireworks are elsewhere at this point—in the tearful confessions between a father and his daughter. Sure, in the moment some of the Murphy-Lucy exchanges felt a bit plodding, like the show was hitting you over the head with reminders of how much Murphy cares for his daughter. But they retroactively felt justified, once the stakes were revealed and Lucy gave up her life for her father. By getting ever more involved with Murphy’s emotional journey, the show is gaining maturity and focus on its bigger thematic stakes, a redemptive arc for a formerly amoral man, and the group that has become inextricably bound to him. The other big dramatic centerpiece is currently more of a mystery: What’s happening to Warren? We’re getting more and more detailed aspects to her strange condition, and until we get to the bottom of what the hell is going on with her, she’s a bit stuck, developmentally. That’s fine—not every major element needs to happen at once. This episode delivered plenty more momentum. We don’t need to get to the fireworks factory quite yet. Sarge is working as a character, but this episode really saddled her with some of the worst lines. I have a hard time picturing anyone saying either “What the FUBAR is that?” or “Die, motherfinger,” especially not a young but battle-hardened toughie. Russell Hodgkinson is probably grateful someone other than Doc is having to say the cornball dialogue. Not that Doc is taciturn or anything. He just wishes they could stumble upon a fully-stocked dispensary for a change. Take note of the advanced tech Warren sees while she’s driving in her vision-world. That seems like Zona-level technology, doesn’t it? Like something the alien-looking ship from last season would have. Dr. Caligari? Pretty blatant reference, Z Nation. Sam and Dean Winchester would be proud. “I had a good life. My life.” R.I.P., Lucy.